Easy Adjustment, Good Braking Performance - TRP Spyre-C Disc Brakes Review. I have one problem with my trp spyre brakes. It's how the cable is attacked to actuator arm. 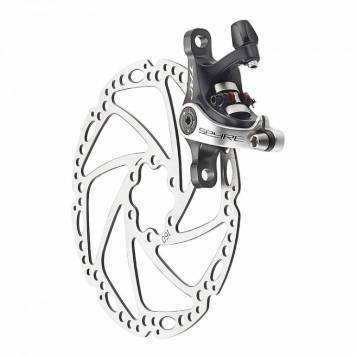 Precisely the rear brake. I don't know, is the rear one defective, or perhaps the shop that sold me the bike had modified the front brake attachment. But the rear one destroys the cable, when tighten the bolt even little too much.. If need to re lease and tighten that bolt few times. The cable is trash. Here's picture of my rear brake cable end, how it looked this winter when I decided to replace it. I was surprised when saw how bad it was. I knew there's one broken strand. I expected that maybe there's one more broken or so, But when I unscrew the bolt. It seems only 4 strands were holding.. Or actually I'm not sure how many strands were really still holding, because they were broken inside clamp.. But those four were not broken. But the front cable was okay. When comparing the clamps holding the cable. I saw the front one had this groove for cable. Here's 2 pics of the front brake cable fastening thing. I can't show the rear one, because to show it I need to unscrew the cable and then, every time I screw it on and undo it. The cable gets more damaged. But the rear one don't have the long groove where the cable can sink in. Just the many short ones that cross the cable and I think those are the ones that damage the cable. I tried to make grove to the rear one also, but the file did nothing to that material.. Maybe I could not put enough force to small file, because it would break.. but with bigger file I can't make small enough groove. I wonder, should I try a angular/power grinder.. Actually the most I want to know, is: Why the front one has the groove. Does your brake have groove also? I wonder, did the online shop in Germany, where I bought the bike 3 years ago, modified that piece.. And what method they used.. It seems like it's grind with grinding wheel.. there are those individual tracks of grinding.. Or maybe they heated it hot and then pressed the cable into it and those tracks are the tracks of each individual strand of cable? I don't believe that, though.. I'm scared to try to cut it with big power grinder.. But... I bought a bit more expensive brake cables. But I could only install it to front, because it would get smashed in rear and therefore no point to use good cable there.. Not before I have solved problem. I also overhauled both brake calipers. With some new grease... The front one was in bad shape. The bearing was rusty. The rear one was still fine, but I backed also that one with a lot of grease.. I used some regular bicycle grease.. finishline grease. I hope it's fine. I did have also brake grease for cars, but.. I thought that it's not a bicycle specific. So I better don't use it. I hate cars. I hope the brakes won't get so hot that they would require brake grease... Rotors yes, they get very hot, but will it really reach to the bearings of brakes.. I hope it will not. Last winter I had an accident because my brakes failed. The irony is that I am very serious about safe driving; I definitely spent a few hours of my life reading about what rules to follow when driving at this time, something like this http://bestadviser.net/how-to/how-to-keep-riding-in-wet-and-cold-conditions/ and I have a lot of practice by the way. So I strongly recommend you dont repeat my mistake and pay maximum attention on your brakes.